What Is Brain Fitness Club? 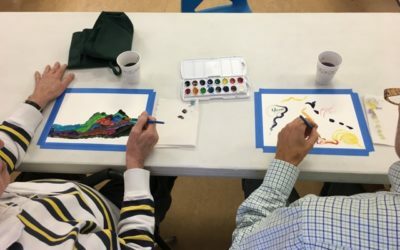 Brain Fitness Club is about maximizing health and well-being of individuals living with Mild Cognitive Impairment and early dementia by providing a therapeutic environment for engaging in brain healthy activities and learning lifestyle adaptations. Multiple studies reveal that adults now fear dementia more than cardiac disease or cancer. A diagnosis of early Alzheimer’s can be devastating news but it doesn’t mean the end of friendship, love and even joy. Watch this video put together by the Growing Bolder team – it will give you a good perspective on BFC. Check out the latest news and updates from Brain Fitness Club here! What I like most about the program is the cohesiveness of activities and the learnings that help us to cope with our circumstances. Well thought out, well-planned; well-executed activities. I think these activities are very helpful for me. I thoroughly enjoy the program from start to finish – especially the candor & feedback from the participants. The team leaders are exceptional!